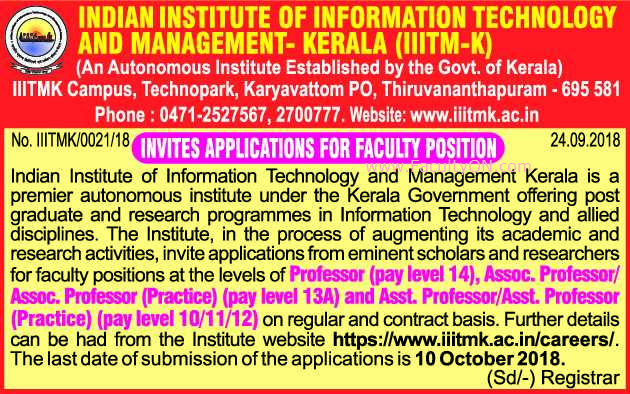 Indian Institute of Information Technology and Management Kerala (IIITM-K, Thiruvananthapuram) has advertised in THE HINDU newspaper for recruitment of Professor / Associate Professor / Assistant Professor jobs vacancies. Interested and eligible job aspirants are requested to apply on or before 10th October 2018. Check out further more details below. About College: Indian Institute of Information Technology and Management-Kerala (IIITM-K), is a university located in Thiruvananthapuram, Kerala, India. It was established in 2000 and is an autonomous postgraduate institution established by the Government of Kerala. How to Apply: Interested candidates are requested to apply ONLINE at official web address provided below.